Modern researchers of medieval military history often wonder what was the nature of the Byzantine weapon called ‘rhomphaia’? 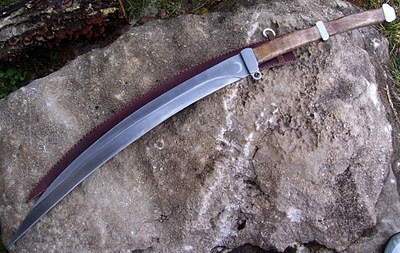 The rhomphaia (or rhomphaea) of Antiquity was a weapon of the Thracians, which consisted of a long straight or slightly curved sickle-shaped blade mounted on a long wooden shaft. If the rhomphaia was sickle-shaped, the cutting edge was located on the inner (concave) side of the blade. Specifically the curved rhomphaia belonged to the group of spears and swords with scythe blade which included the kopis, the machaira, the falcata, the falx and others which were used by various peoples of the ancient Mediterranean that is to say the Iberians, Celtiberians, Greeks, Thracians, Etruscans, Lycians, Carians, Lydians, Phrygians, Dacians and others. Their original source is unknown and sometimes the researchers try to locate it. Our opinion is that they are products of polygenesis. The ancient Greeks and then the Romans were using units of Thracian rhomphaioforoi (rhomphaia-bearers) allies and mercenaries, but they themselves never adopted this weapon. But until the Byzantine period, the Thracians were ethnologically absorbed to the Roman and then to the Byzantine (Eastern Roman) ethnic environment by becoming Latin-speaking north of the Balkan Ridge and Greek-speaking south of it, loosing their own ethnic identity. Thus the rhomphaioforoi combatants were ethnically incorporated to the Romans and the Greeks through Latinization and Hellenization respectively. 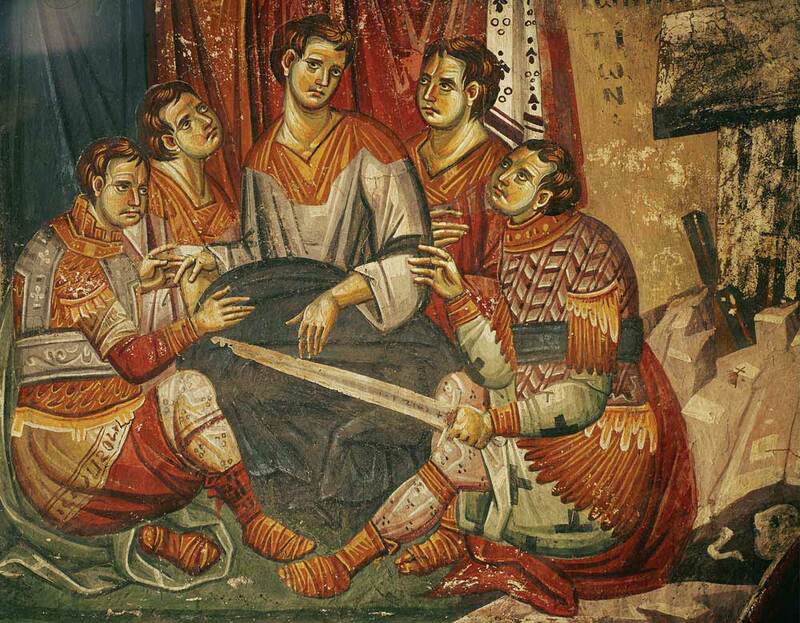 During the Byzantine Period, the word rhomphaia appears in the Byzantine military terminology posing the aforementioned question. 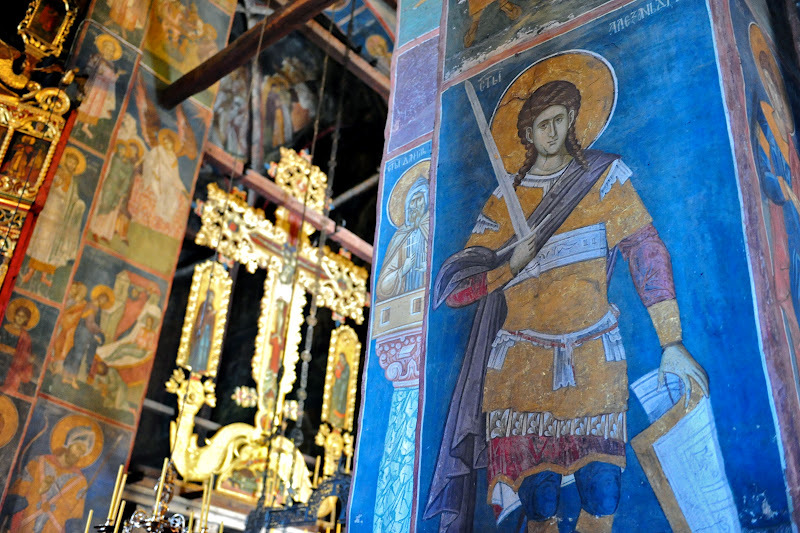 Some examples of long swords in Byzantine frescoes, icons and manuscripts, that can be classified as rhomphaiae (in the plural). 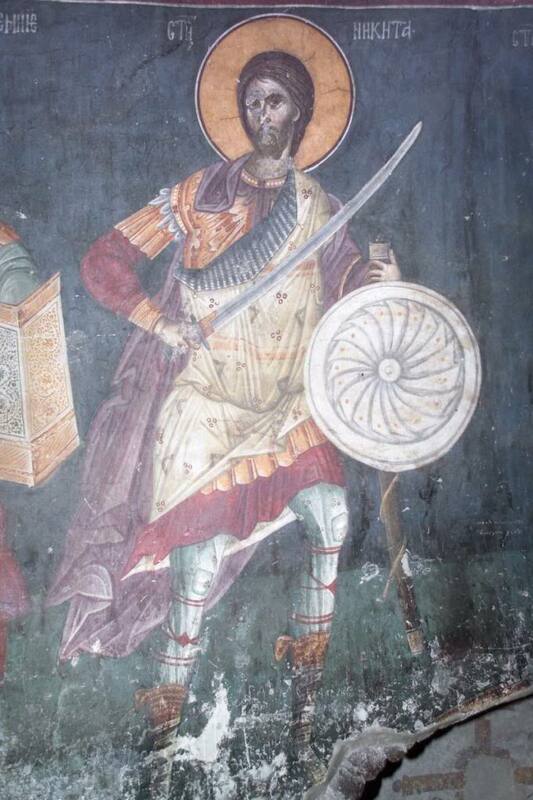 The opening image of this article comes from a Byzantine church in Kosovo and depicts a spathion (σπαθίον), a straight long sword. The other two images depict parameria (slightly curved long swords). Their collective name seems to have been ‘rhomphaiae’. We believe that the rhomphaia as perceived by the Byzantine Greeks, was mainly the typical curved or straight sword of various types whose main feature was the large blade length. Because nowadays the term ‘rhomphaia’ is usually – and falsely – associated with curved blades, if there is a doubt that the rhomphaia could be a straight sword as well, I note the fact that some ancient Thracian rhomphaiae had a straight blade. As inferred from archaeological and literary evidence, some Hellenized Thracians of the Byzantine army went on using the rhomphaia proper (the ancient type) up to the Middle Byzantine period, but this is mere evidence, not a proof. 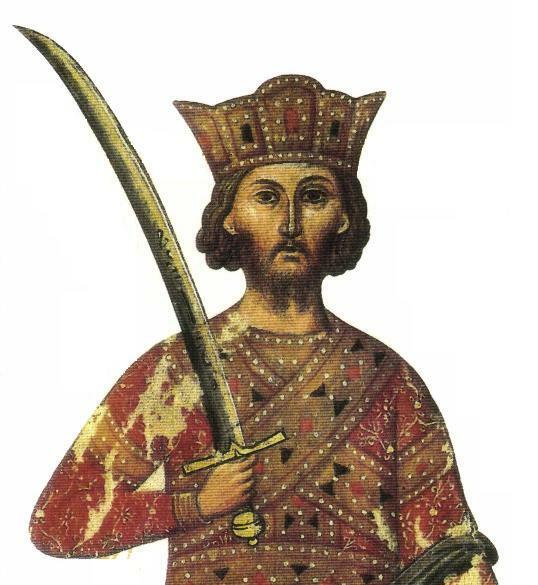 It is probable that the Byzantine term ‘rhomphaia’ represented equally the Thracian rhomphaia proper as well as the very long sword of any type in which the blade was strongly reminiscent of or equated with the blade of the Thracian rhomphaia. Specifically after the final disappearance of the ancient Thracian rhomphaia during the Early or even the Middle Byzantine period, the Byzantines finally gave its name to those rhomphaia-like swords. This ascertainment is reinforced by the fact that in the oldest literary sources the rhomphaia is described or implied as a spear, but with the passage of the centuries it is described or implied as a sword: gradually in Plutarch, Eustathius, Hesychius, Luke and in John’s Book of Revelation. In the ecclesiastical texts especially, the word rhomphaia symbolizes the divine and fair punishment of the unjust and the sinful, a punishment that is usually manifested by the actions of angels. Considering that the angels are depicted in icons and iconographies in churches very often as swordsmen – and never bearing ancient rhomphaiae – we have another indirect testimony on the evolution of the rhomphaia from a spearoid (spear-like) weapon to a long sword. 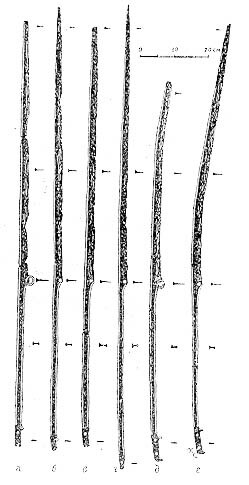 This long sword could be a spathion (σπαθίον) which is the straight one, or a paramerion (παραμήριον) which is the slightly curved sword (saber). Straight and slightly curved blades of ancient Thracian rhomphaiae, from excavations. Modern restoration of the ancient Thracian rhomphaia of Sitalkes II. The cutting edge lies on the inner (concave) side of the blade (weapon credit: Scorpion swords manufacturer/vendor). Especially the curved saber of Asiatic origin that the Byzantines adopted from the Eurasian nomads with whom they were in contact throughout their entire history, and which evolved to the paramerion, had the cutting edge on the opposite outer convex side of the ancient rhomphaia but it was very reminiscent of it in shape and thus the Byzantines had no difficulty calling this saber ‘rhomphaia’ as well. For the same reason, the same applies to the European falchion which never became popular to the Byzantines, not counting their Western European mercenaries. But mostly the same goes for some straight swords of Western European origin, which were also described satisfactorily from the Byzantine point of view with the term ‘rhomphaia‘, because they were very long and handled with both hands exactly like the Thracians handling their own rhomphaia. These swords were reminiscent of the straight ancient rhomphaiae as well as to their way of use, because they were used equally for a piercing blow (and not only for cutting) as those rhomphaiae were used. Two more examples of Byzantine rhomphaiae (spathion and paramerion respectively). Finally, I also note the Byzantine Greek tendency to archaism in the national, political and military terms, for example they often used to call Scythians the Sarmatians, the Huns, the Turkic peoples and generally the nomads, sometimes they used to call Gauls or Celts generally the Western Europeans and other anachronistic archaisms, while the use of Latin military terms which no longer had their actual Latin meaning is well known. The Byzantine rhomphaia was very probably one of those cases of archaism. Although the word rhomphaia had military origins, in the Byzantine age it was rather a generic and usually non-military literal and mostly ‘spiritual’ term (as it was demonstrated above) coming from Antiquity and not a pure military term. This is why there is no an actual example from the various Byzantine Taktika and Strategika of what was the ‘rhomphaia’, thereby posing this frequently asked question among the scholars. It seems that every non-spearoid cutting weapon that was long and relatively heavy was called collectively “rhomphaia”; especially by the non-militants, that is the clergy, the courtiers, princesses like Anna Comnene, scholars like Michael Psellos, and others. The terms spathion, paramerion and several others seem to have been the pure military terms for these cutting weapons that were generally described as ‘rhomphaiae’ by militant and non-militant Byzantines alike. I am constantly perplexed as to why so may people want to go to such selective lengths to try to validate the fiction of an ignorant Osprey hack writer, rather than doing some proper research from the original sources. No doubt the word was used rather loosely by Byzantine writers. However, the description by Anna Comnena of weapons, that she calls swords, that were closely identified with the immediate escorts of Byzantine emperors remains a problem. Whatever the weapon was, it was obviously immediately identifiable at a distance as being intimately and exclusively associated with an emperor’s entourage. It was obviously not a Dane-axe, as Komnenian-period emperors seem to have taken the field with many hundreds of Varangians, and the presence of hundreds of Dane-axes precludes their being identifiable to the immediate retinue of an emperor.